In the annals of Gor Mahia history, the year 2014 will be remembered as the year when Gor Mahia visited the gates of hell but them swiftly ascended back to Heaven. To be sure, there have been other years when the club faced acute difficulties such as in 1974, 1982 and the relegation plagued seasons between 2001 and 2006. In all these cases however Gor Mahia did immediately recover. In 2014, Gor Mahia faced a myriad of problems from losing their sponsor (Tuzo) to being hit with a KES 118 million fine from KRA to losing 10 key players, leaving the CECAFA cup with no wins etc. 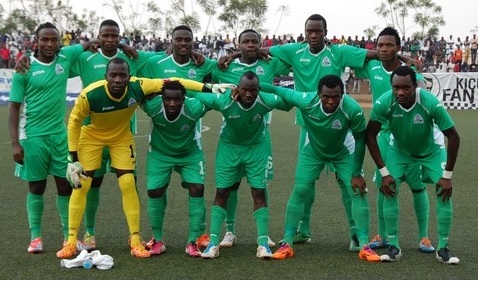 In addition, Gor Mahia faced down a number of enemies hell bent on derailing the club. After all this adversity, Gor Mahia still fought bravely and did just enough to retain the league title they won in 2013. It is indeed fitting that Gor Mahia beat Ushuru aka Kenya Revenue Authority in the final day of the league since KRA is one of the organizations that have been used by the club’s enemies to destabilize the club. Gor Mahia’s 2013 league title was celebrated with pomp and circumstance because the club had gone 18 years without a league title. The 2014 league title will be celebrated due to the steep incline that the club had to climb to reach the summit. Let us take a brief look at the 2014 season and the mountains the club had to climb. There had been rumours suggesting that Tuzo who had been the club’s sponsor for two years was going to end their relationship with the club. Though Gor Mahia offficials claimed to be busy negotiating a renewal of the deal it soon became apparent that no renewal was forthcoming. 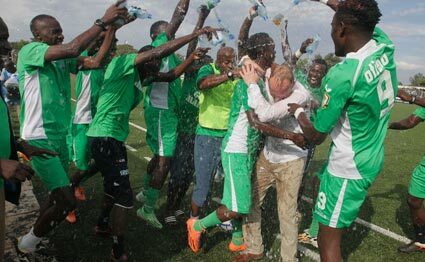 When Gor Mahia returned from Gabon in February, it finally became official. For several months Gor Mahia officials were hard at work negotiating withe various organizations but nothing came to fruition. At one point it seemed that Gor Mahia was set to pen a KES 48 million deal with a local company. The club’s official website even announced that the deal was all but done pending signatures. But at the last minute the deal was cancelled. A local blog now claims that a prominent politician was behind the canceling of the deal ostensibly to settle political scores. Is this true? Maybe. What is true however is that Gor Mahia still managed to stay afloat financially and settle player salaries on time. Credit is due to the club’s chairman. It is indeed amazing that other club’s like Sofapaka with far smaller fan bases have sponsors whereas Gor Mahia, the club with the largest fan base does not. But Gor Mahia still managed to rise above all challengers. Hot on the heels of having lost their sponsor, Gor Mahia were hit by yet another challenge when the Kenya Revenue Authority levied a KES 118 million fine. KRA went a step further and demanded that Tuzo remit the remainder of the sponsorship money to them. They froze the club’s account and also demanded that KPL remit the monthly KES 500,000 to KRA and not the club. Club Chairman Ambrose Rachier cried foul suggesting that the club was being victimized. “We are reading sinister motive in the move by KRA. Why just us. I mean there are 16 Premier League clubs, why just single out Gor Mahia? Rachier charged. Indeed it is inexplicable why Gor Mahia was targeted for harsher treatment by KRA. Kenya’s world famous athletes were not asked to remit taxes for past winnings and neither were their accounts frozen. Since 2011, members of the Kenya rugby sevens team have been the highest paid sportsmen in Kenya with salaries starting at KES 150,000 per month and bonuses of up to KES 190,000 per tournament. Yet it was not until 2014 that the KRFU started to fully remit taxes. And of the 16 teams in the Kenya Premier league, only four were compliant. It seemed like someone or some people were using KRA to destabilize the club. This is not the first time in the club’s history that this has happened. With the club facing an uncertain financial future, many players headed for the exit seeking better deals. Foremost among these was Timonah Wanyonyi who headed to rivals AFC Leopards a team that had earlier rejected him. Shaban Kenga returned to Bandari after the latter refused to renew his loan deal. Anthony Akumu went to Sudan for a loan deal which later turned to a permanent deal. Kevin Omondi and Rama Salim both left for trials in South Africa. Earlier in the year, Gor Mahia had also lost key players like Edwin Lavatsa, Mungai Kiongera and Donald Mosoti. Some players faced long term injuries including Innocent Mutiso and Patrick Oboya, a further hit to Gor Mahia’s decimated engine room. It left Gor Mahia with literally no playmaking options. The most notable injury was that of Solomon Nasio who broke his nose and was left with no medical cover. Thankfully the club’s fans came to his rescue. A further hit came when coach Bobby Williamson was prevailed upon to leave the club for a gig as national team coach. Assistant coach and club legend Bobby Ogolla also suffered what is likely his worst health scare mid season. Luckily for Gor Mahia, Bobby Legend has recovered almost to full strength and has resumed his duties as club assistant coach. 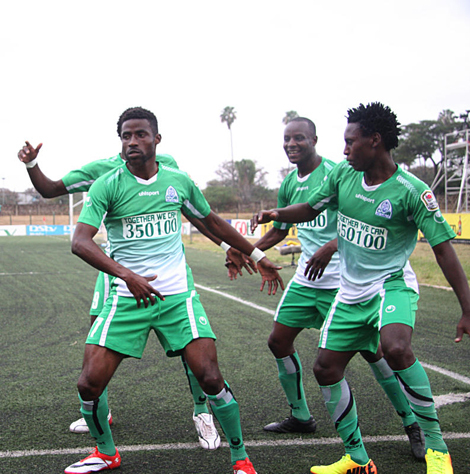 Gor Mahia started the season by losing to Sofapaka in the Charity cup. Worse was to come when they became the first team to lose to bottom club Nakuru All stars. After that loss, stories emerged from the Gor Mahia camp suggesting that players were on a go-slow due to non-payment of allowances. Even worse came when they were eliminated from the GoTV shield by GFC 105, a team most fans had never heard of. Losing 1-3 to arch rivals AFC was a bitter pill to swallow. It came at a time when Gor Mahia were on the verge of losing several key players and AFC officials caused further confusion and instability in the Gor mahia camp by announcing that they were going to sign Rama Salim and Dan Sserunkuma. The ploy may have worked as Gor Mahia played poorly. Shortly after this, Gor Mahia gave a less than impressive performance at the 2014 CECAFA club cup which they left without having recorded a win. Before the debacle against Sofapaka in Machakos, this column was about to pen an article suggesting that in 2014 Gor Mahia fans had been on their best behaviour ever. That went literally went up in smoke, tear gas smoke when police lobbed tear gas cannisters into the crowd fueling a stampede towards the stadium exits. In the ensuing riots, certain shops were looted and vehicles set on fire. Gor Mahia fans had earlier claimed that goons were planning to take advantage of confusion to loot shops. It came to pass and Gor Mahia was blamed for the entire fiasco, yet another significant hit on the club’s reputation. The fracas led Machakos county governor to ban Gor Mahia from the Kenyatta stadium. For the final match against Ushuru, the club’s officials decided to play in Kisumu upon hearing that there were plans by hired thugs to engage in acts of violence to further tarnish the club’s name. the violence was planned to happen whether Gor Mahia won or not. Despite a number of setbacks in other tournaments, Gor Mahia maintained a level of consistency in the national league. The arrival of Frank Nuttall rejuvenated a side that was down. The Scottish coach injected a new confidence in players like George Odhiambo “Blackberry” while pushing Dan Walusimbi into a playmaking position. The changes spurred a Gor Mahia side that appeared destined to lose its league lead. Crucial wins over City Stars (4-1), Muhoroni (3-1), Chemelil Sugar (2-0) enabled Gor Mahia to maintain its lead at the top of the summit. Dan Sserunkuma who has been a consistent scorer in the Kenya Premier League for the past four years, finally won the goal-scoring title. This is the first time a Gor Mahia player has ended as league goal scoring champion since 1984 when Hezborn Omollo who was popularly known by the media as the “goal-scoring machine” ended with 23 goals. 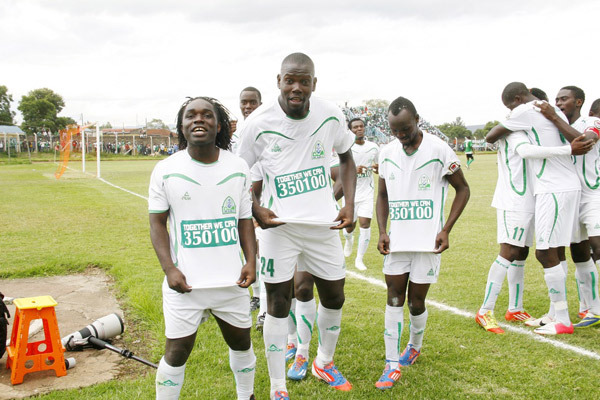 In addition, Gor Mahia scored a total of 43 goals to finish as the league’s second highest scoring team. By contrast, arch rivals AFC Leopards only scored 30 goals. By contrast, when Gor Mahia won the league title in 2013, they scored only 32 goals which was 4th highest in the league. Gor Mahia was also tied for the best goal difference in the league at +22. But Sserunkuma was just a small part of Gor Mahia’s success. The Ugandan duo of Walusimbi and Kizito brought with them a level of professionalism and performance that lifted the rest of the team. Collins Okoth “Gattuso” appears to have achieved a level of maturity and rediscovered the form that saw him named to the national team in 2014. David Owino “Calabar” was solid and consistent throughout the season as was Jerim Onyango whose heroic saves earned Gor Mahia crucial points. George Odhiambo had some brilliant performances reminiscent of 2010. The entire team was solid throughout the season be it Shakava, Pierre, Musa, Erico and others. By winning the league for an unprecedented 14th time, Gor Mahia have now won the league more times than any other club. In addition, Gor Mahia has been the most consistent team in Kenya over the past 5 seasons. Twice they have won the league, twice they have finished second and once they finished 4th. No other team has such a record of consistency. Club Chairman Ambrose Rachier summed it best when after the win over Ushuru he said “We have had no sponsor for one year. Its shows that with determination you can succeed and money is not everything. ” Indeed Gor Mahia climbed a very steep mountain to get to the summit. In many ways, this is one of the most triumphant moments in the club’s history like the 1985 CECAFA cup win and the unbeaten run in 1976. Let us spend sometime in prayer and thanks giving to our LORD JESUS CHRIST for the perfect run.Asante YESU. Go to CHURCH AND THANK GOD. Following on from the brief on Sianga, I have decided to do one on the coaches that followed him. Zico inherited a team well grounded on a studious work ethic learned from the experienced and competent hands of Sianga. Zico’s detractors never saw any positive achievements during his reign. But to the trained and keen eyes, he did very well and was just not lucky not to have won the championship in 2010. Maybe had he fully been supported by all Gor Mahia stake holders he may have won it. In 2010 under Zico, for the first time in more than a decade we threatened the stranglehold of the cooperate teams in the League. We stormed passed many and finished as Runners up behind Ulinzi Strars. In 2011, we regressed because of internal club politics and finished in position 5. This was still better than wht we had become accustomed to:- fighting against relegation season after season. It was achieved despite the fact that the club was living from hand to mouth. This was before the advance of cooperate sponsorship of local clubs. The less said about Anaba Awono, the Cameroonian, the better. He was never an improvement on Zico, both tactically and technically. BW completed the roof and brought the TPL home in 2013. His method was a complete turnaround from what we were used to. He adopted a very ultra defensive tactic and tended to employ counter attacking football. We watched Gor Mahia play long balls against inferior teams like KCB, City Stars and Chemelil FC. This was completely against our tradition of tiki taka and controlling possession. I cannot remember Kogalo registering a win over Efusi when BW was at the helm of Gor Mahia. Among the players that he inherited were Logarusic’s favorites such us Anguyo, Njuguna (Pablo) Mosoti, Rama and Ali Abondo. All of these players have since left Gor Mahia. After a start stop kind of performances at the beginning of 2014, BW finally ditched us at the halfway stage. That is to say he lasted almost as long as Logarusic did. I believe our disastrous performance at this year’s CECAFA Club Championship hastened his departure. I’m sad that he chose to take up the more treacherous job of coaching Harambee Stars. We can therefore say that Bob Williamson was somehow successful. But we must commend him for bringing in a successor who has proved to be a master tactician in Frank Nutall. Sir Alex Ferguson couldn’t do this for Manchester United. performances not to mention individual players. The defence plays with a lot of freedom and in different formations while the midfielders have mastered the art of measured & controlled pressing. We can now grind out results without necessarily worrying about conceding. Watch out for a much improved Oboya, and we should being back Kevin Omondi. Its over to you the EC. Secure sponsorship early and give FN and the players with short term contracts long ones. All the players should be assessed before releasing some to create room for new arrivals. Do not be tempted to overhaul the team. Congratulations for winning title number 14 in the year 2014. God bless Kogalo Mayienga Mayiengo Piny. Le Pastre si ututumieko kitu kwa “Okoa Gor Mahia Brand” players’ motivational fund. …extremely happy to be part of the transformation after joining the club leadership in may 2005…congrats to everyone…the work is now well cut, lets roll our sleeves and take the club to where it belongs…i still long to see this club in its own training ground with a proper club house and most importantly to have the club completely self reliant…its possible..long live k’ogalo…. Jimmy hiyo ni ukweli do you remember the time agido was the coach ,we had very young players putting on jersies which were extra extra large on them but the soccer they were playing ,i loved it,then zico came with his helu helu type of playing and we achieved nothing a part from selling black berry who was still not mature for proffesional soccer.congratulation to agido and sianga. LINDA GM BRAND BLOGGERS STATUS REPORT. BLOGGERS PLEASE POST ANY UPDATES YOU MAY HAVE. 5 Ochigah- FX07 JR298 confirmed kshs 2000 send to Charles Otieno. 7) Dan Original – FX41AD760 Confirmed. Ksh 1,000 sent to Charles Otieno 0720323083 on 2/11/14 at 8:33pm. 8)Jasawagongo Mpesa transaction details FX45ZGO72 Kshs 1000 on 3/11/2014 at 11.11AM. 10)@ The Villager MPESA transaction FX78L973 confirmed kshs 2000 send to Charles Otieno. 11)ERICO Jarae MPESA transaction FY10GW390 confirmed kshs 2000 send to Charles Otieno. @ Ronald Ngala herein lies a possible solution/answer A sacco of 12,000 members each making a monthly contribution of kshs500 to raise kshs.6M monthly or kshs.72M per year. Attach tangible benefits to membership e.g priviledged seating/entry, discounted tickets etc. Do this and everyone fan will want to be a member. The good thing is that the boring song that ‘ Gor has never won their last match’ will not longer be played nor is the ‘silent’ jinx that we don’t win when the Patron is present. From the lessons we have learnt i think we will be in a better position to perform even better next year since the pressure will not be on us anymore. Our performance this year is now a case study for ingwe, tusker and sofa to learn from. I think the boys now need to rest as they have earned it. Not sure if the DsTv cup will be held this December but the U19 can mix with the main team for that one. i also oomment the EC team,they kept off the media,while their counterparts at sofapaka and ushuru were all over.The talking was done on the pitch. Kenyatta even said he hopes to enhance his profile with the gor game which indeed he did by registering a double digit loss.